There’s something fascinating about watching a veteran actor practice his craft. In MAD RIVER RISING, Robert Hogan gets to deliver some great one-liners. His timing is rich and his cantankerous take on the character of “Angus Stewart” is a treat. Angus’s story is full of loss. He’s losing his farm – one way or another. He’s losing his faculties and with it, his independence. It’s sad. His grandson, Charlie, though has arrived to intervene. Not taking into account the hard work of daughter-in-law, Marie, he bulldozes his way into a situation where he’s not welcome and uncovers a few secrets along the way. This is a slow-paced script. Act One suffers from too much spoken exposition. Things pick up a little in Act Two, as the drama intensifies between the characters but its still a little plodding. In spite of this, Director Blake Robison does a nice job balancing the flashbacks and imagery with the overly-complicated contract law discussions on stage. This is only the second production of this play; it could use some more edits, less talking, and a little more action. I’m sure t will continue to evolve. Hogan carries the show; the other lead actors took some time to rev up on opening night. I also enjoyed the work of Billy Finn as “Spencer.” He is by far the most comfortable and natural actor on stage. As usual for the Playhouse, the lighting and sound, sets, and costumes are excellent. Robison has assembled a above And I really wonder how they plan to fix the wooden beam that Angus takes an axe too at the start of the show. 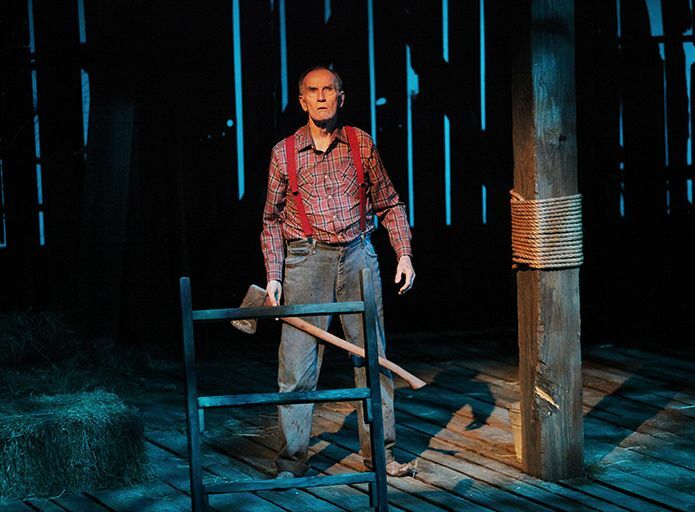 MAD RIVER RISING runs through November 14th in the Marx Theater at the Cincinnati Playhouse in the Park. Get your tickets here.